Can Statin Use After Diagnosis of Esophageal Cancer Prolong Survival? Statin use after a diagnosis of esophageal adenocarcinoma, but not esophageal squamous cell carcinoma, reduces esophageal cancer–specific and all-cause mortality, researchers report in the April issue of Gastroenterology. Esophageal cancer is the fifth most common cause of cancer-related death in men and eighth most common cause in women, worldwide. Esophageal squamous cell carcinomas (ESCC) are the most common histologic subtype worldwide, but the incidence of esophageal adenocarcinoma (EAC) has increased rapidly since the 1970s and the most common form in the West. Fewer than 20% of patients with esophageal cancer survive for 5 years. Statins (3-hydroxy-3-methylglutaryl coenzyme A reductase inhibitors) are cholesterol-lowering drugs that have also been reported to have anti-cancer effects. 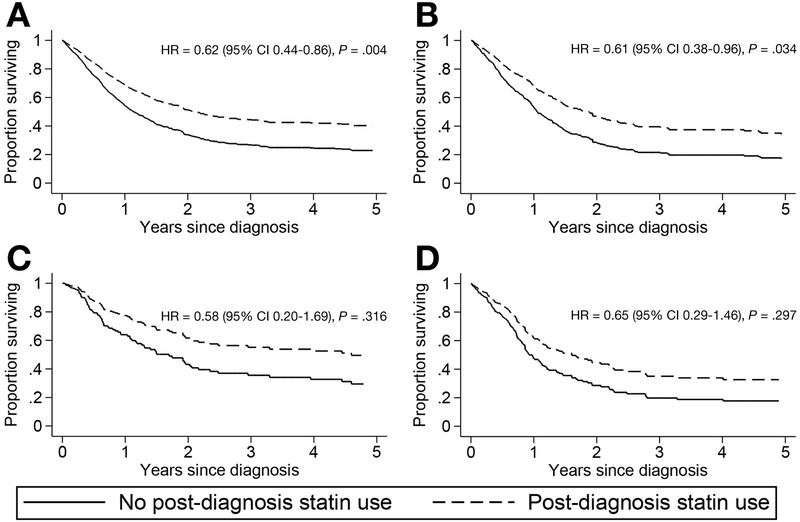 Statin use after diagnosis has been associated with a reduced risk of cancer-specific mortality in from prostate, breast, and colorectal carcinomas. Statins were also found to reduce risk of liver cancer. Statin use has been inversely associated with the development of the histologic subtypes of esophageal cancers. However, it is not clear whether statin use after a diagnosis of esophageal cancer prolongs survival, or has different effects on EAC vs ESCC. Leo Alexandre et al sought to determine whether statin use after a diagnosis of esophageal cancer reduced cancer-specific and all-cause mortality in a large cohort (4445 men and women) in the United Kingdom. They collected their data from the United Kingdom General Practice Research database, the UK National Cancer Registry, and the Office of National Statistics database. A total of 830 patients were prescribed statins after their diagnosis with esophageal cancer—163 were new statin users. Overall, patients in the whole cohort were more likely to be male, smokers, and overweight or obese. Alexandre et al found the median survival time of the entire cohort to 9.2 months. Among subjects who used statins after a diagnosis of esophageal cancer, the median survival time was 14.9 months, compared with 8.1 months for statin nonusers. In the entire cohort, statin use after diagnosis was associated with 39% reduction in esophageal cancer–specific mortality and a 33% reduction in all-cause mortality. In patients with EAC, statin use after diagnosis reduced risk of esophageal cancer–specific death by 39% and death from any cause by 37%. However, post-diagnosis use of statins did not reduce mortality among patients with ESCC or esophago-gastric junction adenocarcinoma. Significant dose and cumulative dose-response relationships were observed for pre-diagnosis statin use and all-cause mortality in the whole cohort. How might statin use prolong survival of patients with esophageal cancer? Alexandre et al explain that statins promote apoptosis and limit proliferation in EAC cell lines. Statins inhibit 3-hydroxy-3-methylglutaryl coenzyme A reductase (HMGCR) to reduce production of intermediates in the mevalonate pathway, including farnesyl pyrophosphate, which are required for the prenylation and membrane localization of GTP–bound proteins, including Ras. By limiting Ras farnesylation, statins inhibit cell signaling pathways that promote survival and proliferation of EAC cells. Alexandre et al state that this is the only observational study to date to investigate the effect of statin use post-diagnosis on survival in patients with esophageal cancer. However, these results require replication in other large cohorts and provide further evidence in support of the conduct of randomized controlled trials of statins as adjuvant agents in patients with esophageal cancer.